United By Blue pledges to remove one pound of plastic pollution from the ocean for every clothing product sold, and sources materials from recycled products. United By Blue creates durable outdoor wear that allows customers to explore nature while contributing to a cleaner ocean environment. Their team organizes volunteer clean up events to match their sales numbers. In 2018 alone over 2000 community volunteers worked with United By Blue on clean up events across 23 US states, as well as one event in the Netherlands. One particular project targeted an illegal dumping site in Philadelphia, where the volunteers removed over 400 tires from the Schuylkill River, in addition to construction waste and pieces of styrofoam. United By Blue worked with the Philadelphia Water Department to establish barriers to prevent future trash build up. In addition to taking plastics out of the ocean, clothing and camping gear are made of sustainable materials that have reduced impact on the environment. Recycling is done in creative ways, such as reusing the ripstop fabric from sails from boats, using plastic bottles to create polyester, and utilising bison down which is often discarded by ranchers. Low-impact natural materials are used as well including organic cottons, and tencel which comes from fast growing eucalyptus trees that require very little water to be grown. Every year 8 million tonnes of plastic enter the world’s waterways. It takes centuries for the average plastic to break down meaning that they will be polluting ocean resources long after they are used. Plastics that end up in the ocean gyres have created circulating vortexes of trash. Infamously, the Great Pacific Garbage Patch is twice the size of Texas. While many clothing brands produce new synthetic plastic to produce their products, United by Blue uses what would be otherwise wasted resources. Plastic pollution contains toxic chemicals that are harmful to marine life when debris are consumed. To date 680 tonnes of trash has been removed from the world’s waterways by United by Blue. 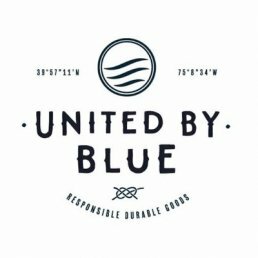 United by Blue offers outdoor wear sourced from recycled and sustainable materials, and organizes clean up events to remove plastic pollution from waterways.